A magnetic pulley or a crossbelt magnet can play an important part in your grinding operations. They remove nails and staples out of crushed pallets and C & D debris. A magnet can make unusable raw materials into a very desirable product when used in conjunction with your tub or horizontal grinder. Whatever your application is, a magnet is a low cost way to remove that unwanted ferrous metal from your waste stream. They require very little maintenance and can last for years with proper care. A typical permanent magnet (magnetic pulley) replaces the last pulley on the stacking conveyor (the highest pulley when the conveyor is elevated) of a grinder. It forces the ferrous metals to “stick” to the underside of the conveyor as it passes over the magnet. As the conveyor belt pulls the metals from the magnet, the metals drop onto a chute where gravity takes over. You may then collect the metals in a bucket, dumpster or box for recycling. Installation is often very simple. Four bolts on a set of pillow block bearings normally hold the pulley in place. Loosen the conveyor belt, remove the old pulley and install the magnetized pulley. This type of installation does not require electricity. 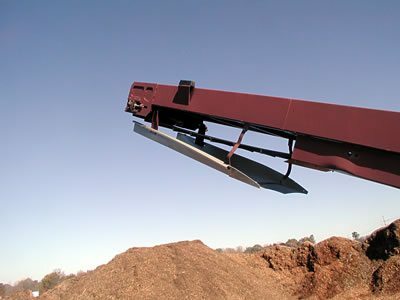 Crossbelt magnets are typically more expensive but offer better “cleansing” of ferrous metals from your grindings. They will require electricity and be considerably more expensive. However, in many applications, there is no substitute for a reliable crossbelt. The majority of tub and horizontal grinding applications can utilize a permanent magnetic pulley. Our magnet resource can be less than half of the cost of a comparable factory, permanent magnet. Download our forms and fax them to our supplier for a quick quotation or contact us for more details.